Lenticchie is the Italian word for “lentils”. They are one of my favorite legumes, and lend themselves particularly well at this time of year when the desire for earthy-flavored dishes of all types is high. I’ve been using lentils in several meals for the past two weeks, a few of which will be appearing in posts later this week once I get around to writing them. I wanted to get this out tonight though, while the iron is hot. Those of you who happen to be vegan, follow a gluten-free diet, or are looking for a little dinner excitement might like what’s on the menu. As an aside, I mentioned to a friend on Facebook tonight that my year-long project in 2012, The Year of Cooking Seasonally, completely changed my life in ways that I never thought possible. I gradually shifted from a meat-centered diet to a meatless-focused lifestyle. In doing so, I also broke out of the culinary hole that I found myself in at this time twelve short months ago. While the idea of cooking and eating seasonally for an entire year may not be for everyone, might you consider giving it a try one of these days, if only for a couple of weeks? Sometimes what is seen as a limitation is in fact, a liberation. Winter salads need not be joyless or cheerless. All you need is a touch of inspiration to create magic at dinner. For instance, you may already be familiar with roasted brussels sprouts from their appearance at your Thanksgiving table. Here, they provide a delicious contrast and a re-imagined purpose in a gluten-free version of tabbouleh. For this salad, try to obtain dried brown lentils instead of canned. You won’t have to pre-soak them, and the difference in flavor is immeasurable. While canned lentils are all right in some preparations, I find that there is a “clean” taste to my palate that is missing whenever canned product is used instead of dried. 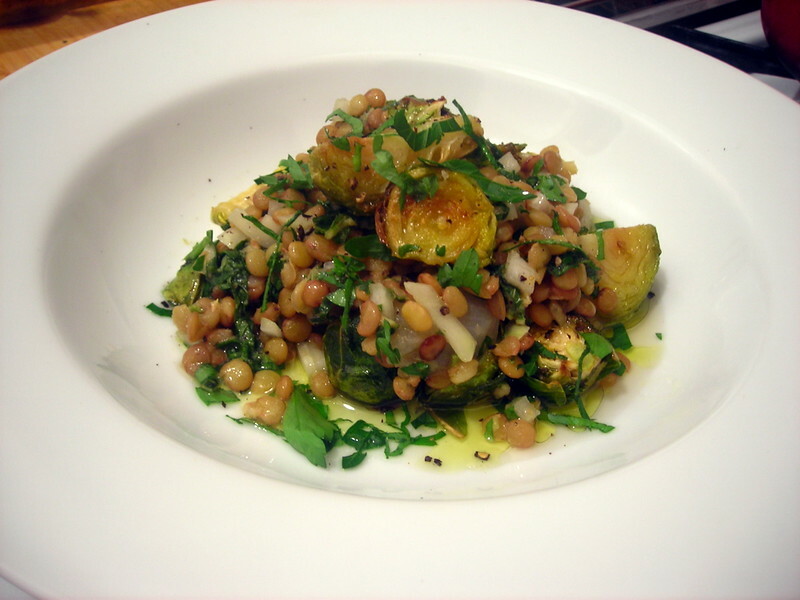 The salad has three components: the lentils, the brussels sprouts and the dressing. In a saucepan, combine the lentils, water, bay leaf, sea salt and onion. Bring this mixture to a boil, then reduce heat to medium-low and simmer, partly covered, for 25 to 30 minutes or until the lentils are tender. Drain the lentils and set aside. You may want to consider reserving the lentil cooking liquid for another use; try substituting it in place of water the next time you cook rice or dried beans. Trim the brussels sprouts of their stem ends (and outer leaves, depending on size). Halve or quarter each sprout, then toss the sprouts olive oil and a pinch of sea salt. Spoon sprouts onto a roasting pan or Pyrex baking dish. Roast for 35 to 40 minutes at 375 F or until the sprouts are crisped on the outside and tender on the inside. Remove the pan from heat. Ideally your sprouts and lentils should be done as you make the dressing. Note: You can vary the proportions for the dressing ingredients to your preference. The above was provided as a rough guideline. In a small bowl, combine the minced onion, about 4 tablespoons minced parsley and mint, lemon juice, extra-virgin olive oil, sea salt and black pepper. Mix well. Add the cooked lentils to the parsley mixture. Mix well. Next, spoon some brussels sprouts onto salad bowls, spoon some lentils atop the sprouts, then top with any remaining minced parsley and mint. Serve at once. Time: About one hour, including prep. The vast majority of the time will be spent on cooking the lentils and brussels sprouts. Edit: Clarified text in the recipe and headnote. This is my submission for Weekend Herb Blogging #366, which will be hosted and organized by Haalo of Cook (almost) Anything. Weekend Herb Blogging is a weekly foodblogging event that was originally begun by Kalyn of Kalyn’s Kitchen. Lucy’s Kitchen Notebook — Caviar de la Croix Rousse, in which Lucy describes a Lyonnaise specialty, lentils cooked with smoked bacon and herbs, and served with a shallot or garlicky vinaigrette. 02 Jan	This entry was published on January 2, 2013 at 5:58 am. It’s filed under American cuisine, cooking, food, food photography, Gluten-Free, recipe, vegan, vegetarian, Weekend Herb Blogging, winter and tagged brussels sprouts, food blogging, food photography, gluten-free, lentils, recipe, salad, vegan, Weekend Herb Blogging, winter. Bookmark the permalink. Follow any comments here with the RSS feed for this post. In the spirit of one of my new years resolution to try new things, I’m going to give your salad a whirl in the hope that I start to like brussels sprouts. Thanks for that. I’m looking forward to reading your posts in the coming year. Keep them coming! My pleasure, Gustia. Let me know how it works out for you. Can you please change your font colour. Grey text on a white background is very difficult to read if your eyesight is less than perfect. I gave up on this. Hi, Ken. I’ll look into it, but note that I’m using a template that, without knowledge of coding, might make it impossible for me to do so in a timely manner. The alternative is a black background with white colored text, and while that might be easier for you to read, it would definitely turn off a huge number of people. I have to keep that in mind. Okay, I changed the color of the text in the body of the post from gray to black. I did it the hard way by hand-coding in HTML every single paragraph. The alternate (and easier) method is only possible by purchasing an upgrade that costs $30 a year. That option is something I’ll be looking into, in the future, but right now, it’s not a priority and won’t be for some time. By the way, changing the color of the hypertext links, not just in the body of this post but throughout the blog — in the sidebar, in the blogroll, on other pages — from light blue to some other color like red for example, is not possible by hand-coding in HTML. For that, I’d have to switch to another theme (which I’d rather not do at this point in time), or purchase the aforementioned upgrade. Hopefully this change works for you. It’s the best possible solution I could implement at present. Lentils and brussels are two of my favorite things, so this dish looks absolutely heavenly!! I love the idea of a bit of mint in the dressing. What a nice idea to eat lentils! I am actually in a roasted Brussels sprouts “period”: I could eat them every day and I like your presentation. Thanks for mentioning my post on lentils from Castelluccio: they are the ones I grew up eating and I recommend them, if you can find some. Happy New Year! Always glad to refer folks, Simona. Thanks for stopping by. Delicious! I’ve pinned this so I can try it soon. Just to clarify, this is a side salad? Or is it filling enough for a meal? I love beans and lentils, can’t wait to check out your other recipes. As written, you could serve this as an appetizer or a side dish. It’s probably not substantial enough as a main course for two people. The vast majority of recipes on the blog are sized for one person (i.e., me). There are exceptions of course, like pasta and congee, but that’s okay because I never met a carb I didn’t like. I agree with you that eating seasonally (we joined our first CSA farm share in 2006) can change your life. This looks delicious and I look forward to trying it. Thanks! Thanks, Kirsten, and let me know how it works out.